There is something uncanny about staying in another person’s house — the stark differences and the small convergences of sameness. We all like to snoop a bit. Now, public historian Ruth Goodman gives us the chance to snoop on the lives of people who died 500 years ago. When you’re watching The Tudors or Wolf Hall, Goodman is the woman behind the scenes ensuring that the clothes look right, the home interiors are accurate, and the sumptuous feasts are as true to life as possible. In How to Be a Tudor: A Dawn-to-Dusk Guide to Tudor Life, she makes her almost preternatural knowledge about life during the 16th century available to the reading public. This is a guide to the everyday, not the extraordinary, and that is what makes it so exceptional. This is not necessarily a book for royal fanatics; Goodman writes that her “interest has always been bound with the more humble sections of society.” Goodman’s approach mirrors that of the last generation of social historians who have focused on the lives of common people. But as she explains that for the modern general reading public, “information is still thin on the ground.” Scarcity notwithstanding, as someone who researches and writes about the literature of the period, I found Goodman’s knowledge humbling. While I have positions on whether John Milton was an orthodox Calvinist or an Arminian, or George Herbert’s theology on salvation, I know much less about what they ate for dinner or how they kept their pants up. And sometimes, everything hinges on what you had for dinner and how you keep your pants up. In the tradition of fellow popularizer Ian Mortimer, Goodman attempts to address this gap while appealing to our natural curiosity about the lives of other people. She in part confirms what we expect about the past, that it was a very different place indeed. Intuiting that men and women of past centuries inhabited a different mental space is one thing, but Goodman conveys just how different this world could be from a physical and sensory perspective. There was the omnipresent smoke that would have filled homes until chimneys became common in the middle of the period. There was crowding: “few people had a room to themselves.” Fashion was legally bound to social status; “thoughtless dressing could land a man in legal trouble,” since your clothes literally demonstrated your credit worthiness. Although this was a culture where though print was becoming cheap and the Reformation encouraged reading (if not necessarily writing), only 20 percent of men and 5 percent of women were literate by the beginning of Queen Elizabeth’s reign. The average Tudor had a much less sedentary day, fueled by an incredibly high-carbohydrate diet, in which 80 percent of a family’s budget could be devoted to food and where famine was an annual concern for poorer families. Physical activity marked not just the lives of the plowman and the domestic; even writers had to cut their own quills and mix their own ink (which would have made this review a lot more onerous). 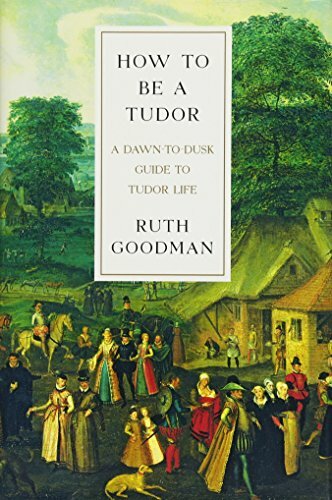 Goodman is also “constantly delighted with the ‘otherness’ of Tudor thinking and beguiled by the echoes that have slipped through into modern life,” and her enthusiasm is infectious. Yet not all was alien; Goodman often bucks our assumptions about what life in early modern England might have been like. Popular culture tends to portray the period as one of superstitious, filth-covered peasants living in a pre-technological world. Instead, we’re confronted with a culture in which the average age of marriage for men and women was a rather modern 26 and 24, respectively — one where the normal hygiene regiment would allow one to “pass unnoticed in modern society” and the preferred breakfast was bacon and eggs. Reading Goodman’s account can feel a little like the historical equivalent of analyzing a childhood photograph of yourself: we find in her Tudors a blurred reflection of ourselves. So much of my own literary study is grounded in abstract ideas, literary critical jargon, and cleaned-up copies of texts. But literature and culture are not born in a vacuum. Goodman writes: “I found myself increasingly drawn into the web of life, the way everything connected, the interplay between the physical world, ideas, beliefs and practice.” This poetry of small things — the ache of muscles after a day of labor, the feeling of isolation when one is a stranger in a strange land, the fumbling of partners under a blanket — are cumulatively that on which all other meaning depends. This book reminded me how much of the lives and creations of the time period I study were born out of messy, mundane, prosaic physicality (same as it is in any time period). The material is indeed the base of all other experience and contemplation; to read texts through this particular materialist lens is to re-enchant the world of our very lives with the sacred urgency of the poetic. What are the facts of material existence other than the very subject of great literature? Though she only utilizes literature sparingly, Goodman makes this lesson abundantly clear. How to Be a Tudor continually makes the mundane and the prosaic shine. What was a night’s sleep like for William Shakespeare? What was breakfast like for Milton? What clothing did John Donne wear? These are the conditions that shaped the creation of Hamlet, Paradise Lost, and The Holy Sonnets. The food these people ate, the layout of their homes, their experience of walking down a London street were not incidental to their lives. We would not dismiss the material conditions of our own existence as unimportant; how can they be so for the greatest poets of the English language? How to Be a Tudor has helped me to partially remedy this lacunae concerning that poetry of small things. I was already going to read the book, but the write-up was lovely.